Thanks to The New York Times' reporter, Sarah Lyall (@SarahLyall) for her front page profile on Ryanair CEO, Michael O’Leary. Those reported smart lessons make for a Harvard case study on how every industry must refocus how they operate and manage growth during challenging times. [On a related note, Delta Air Lines profiled ScanMyPhotos.com in Delta Sky, its in-flight magazine, so there is a connection between us and the airlines. Nearly 15-million worldwide passengers will read their "Editors' Pick profile]. Just like the airline business, the photo industry is ripe with failures too. Rather than fuel costs being the transcending inconvenience, for us it was technology, a devastated economy and the transition from film-to-digital that burdened our business model. However, it is possible - and we proved it - that any type of threatened industry can instantly reinvent itself; in our case this was a 19-year journey but the results are now transparent. Mr. O'Leary's message about Ryanair is a salutable model for every business. To reinvigorate and reengage customers, it requires a new approach. Pricing, technology and instant service is paramount and augments an uncompromising commitment to professional quality. Just as travelers want to safely arrive at their destination and not pay a premium price, ScanMyPhotos.com has equally pioneered a new way of thinking about pictures. There are 3.5 trillion analog photos tucked away in shoe boxes. These fading memories must be shared, preserved and repurposed for today's all-digital computer world. People do not want to invest the time to scan images themselves and they want it quickly and affordably, for literally pennies per scan. For Mr. O'Leary, it went as far as charging for in-flight lavatory use. When asked what happens if "the plane were stricken by some nasty, effluent illness, like food poisoning? A snorting noise wafted over from the chair where Mr. O’Leary was sitting. “We don’t serve enough food for everybody to get food poisoning,” he said." At ScanMyPhotos.com, we recognized that millions of domestic and international picture-takers also want no-frills service, but, Ritz Carlton-like service. The KODAK slogan is "you press the button, we do the rest" and that too has been our principle motto. We provide the basics, plus a menu of hundreds of other ways to share and save photo memories. Once the images are digitized, we provide the magic that enables consumers to jettison how they historically thought about pictures; especially those memories from decades and generations of favored photographs. Like Ryanair, since 1990, our business has always had shock value, but in a remarkable way; orders are completed and returned faster than it takes to find your seat on an airplane. It is the magic behind what we do and how we dazzle our customers that has caused such raving reviews, from The New York Times Personal Tech columnist, David Pogue, to the scores of other news profiles. A key value proposition is also our free 24/7 live support help desk to instantly solve most photo imaging questions [give it a try]. The backstage secret: Always trust KODAK technology, it has been a boon to our business. We are even recognized by Web100 as the sixteenth best photography Web site. It is back to the future as tens of millions of analog photo snapshots are instantly being digitized to share and preserve generations of family memories. There is an urgency to digitize photos, slides and negatives before it fades away. To help, we are the pioneers of super-fast and affordable scanning (pay $64 to scan up to 1,000 photographic pictures in minutes) by commercializing all types of KODAK technology. Organizing and sharing photographs has never been simpler or more necessary as thousands of new iPhone, Internet and retail photo lab applications are driving demand to revisit pictures. Photo scanning is reinventing and growing the entire photo imaging category and we are honored to play a key role. Because of our international stature, the company regularly travels the world in our quest to educate and invent new growth opportunities. During the next few months, we will traveling to Italy, Greece, Egypt, Germany, New Zealand and Australia. The company has been a longtime and active member of the Photo Marketing Association for nearly twenty-years. By solving the biggest problem in photography, bulk photo scanning is fast, effortless and affordable. Send your photos, or order online the prepaid, fill-the-box service that holds about 2,000 photos from ScanMyPhotos.com which includes same day service and completely free shipping for just $149.95 (buy two boxes and the third is free). Scanning is also revitalizing the entire photo imaging category. Once pictures are digitized, consumers are ordering reprints, giant collage enlargements, custom photo greeting cards, photo albums and dozens of other products online at ScanMyPhotos.com and at its retail photo center, which exclusively promotes KODAK photo kiosks, printed on the new KODAK APEX eco-friendly dry lab system. There are also thousands of independent KODAK photo kiosks located throughout the country and abroad. Los Angeles Magazine’s “Best of LA” August issue featured ScanMyPhotos.com as “the country’s leading source of quick scans” (p. 113). Nearly 15-million airline passengers will also be reading about ScanMyPhotos.com in the August issue of Delta Sky Magazine, which selected ScanMyPhotos.com for it’s “Lifestyles Editors’ Pick” profile (p 39). Learn more from our hundreds of blog postings at Tales from the World of Photo Scanning and on Twitter. ScanMyPhotos.com International is a division of 30 Minute Photos Etc., founded in 1990 by Mitch Goldstone and Carl Berman. Pictures are Everything, we make yours last a lifetime and more. Thank you for trusting us to help preserve and share your memories. IRVINE, Calif.--“Pictures are everything, we make yours last a lifetime and more,” is what ScanMyPhotos.com has championed as a pioneer in super-fast and affordable photo scanning and digital imaging. This slogan is the foundation for the parent company’s (30 Minute Photos Etc.) 19-years of leadership in the photo imaging industry. Goldstone will share proven tips about how his company gained international recognition and customers by implementing social network marketing. You will take away invaluable lessons that you can immediately implement to enhance your sales, reputation and buzz-marketing for your memory business. ScanMyPhotos.com is a well-known leader in the photo imaging industry. 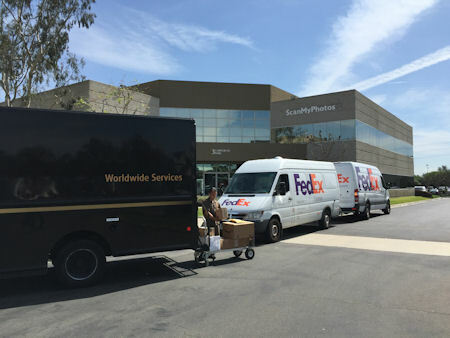 The company operates a retail photo center in southern California and an international ecommerce digital imaging enterprise which has scanned tens of millions of photos since 1990. They regularly are profiled in the national media for its innovations and entrepreneurial creativity to help picture-takers save and share their generations of photo memories. The ScanMyPhotos.com Web site lists scores of news profiles, including a profile in The New York Times by “Personal Tech” columnist, David Pogue and is ranked #16 on the Photography Web 100 listing. Follow them on Twitter (Twitter.com/ScanMyPhotos) and at Tales from the World of Photo Scanning [blog.ScanMyPhotos.com].